We know you’ll get lots out of Commercial Motor. Join us at the heart of the marketplace. If your business involves buying, selling or running new or used commercial vehicles, then Commercial Motor is the publication for you. 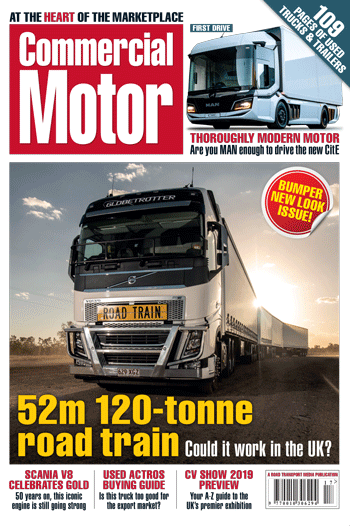 Every week our team of experienced journalists drive the trucks that keep the UK road transport industry moving, helping our 23,500 readers to make informed purchasing decisions. We’ve been at the heart of the marketplace since 1905. As a Commercial Motor reader, every Thursday morning you’ll be faced with a huge dilemma - which half of the magazine to read first! Start at the back, and scour the 1,000s of quality used trucks and trailer classified adverts, and you could very well snap up a fantastic bargain. However, start reading Commercial Motor from the front, and you’ll be one of the first to learn what’s new in the world of trucks.